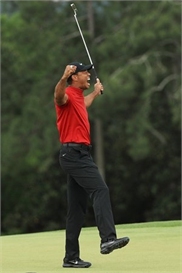 Tiger Woods captured his 15th major title with an epic back-nine rally in the final round at the US Masters Tournament on Sunday, making a mighty comeback after his 11-year major drought. Tommy Fleetwood may already be one of golf's most recognizable players but the mop-topped Englishman is determined to be marked out as winner rather than for a great head of hair. Newcomers, past winners and a host of green jacket hopefuls made final preparations Sunday at Augusta National on the eve of official practice rounds for the 83rd Masters. Sergio Garcia blundered with a hasty stroke Saturday to lose a hole in falling to Matt Kuchar at the WGC Match Play Championship, then asked his US rival to surrender a hole. Australian Scott Hend beat Spanish overnight leader ­Nacho Elvira with a birdie on the first playoff hole to win the co-sanctioned $3 million Maybank Championship after wild weather triggered a dramatic finish on Sunday. International team captain Ernie Els has named South Korea's KJ Choi, fellow South African Trevor Immelman and Canada's Mike Weir as his final three assistants for this year's Presidents Cup in Melbourne. Patrick Reed says he's mentally stronger with better shotmaking entering the Masters than he was last year when he won the green jacket, even if his results don't show it. Rory McIlroy said Wednesday achieving a career Grand Slam at the Masters next month would be "awesome" for golf as he warms up for Augusta at this week's Arnold Palmer Invitational in Orlando. Red-hot world No.2 Park Sung-hyun shot a stunning best-of-the-week round of eight-under-par 64 on Sunday to claim a two-stroke victory at HSBC Women's World Championship in Singapore. Dustin Johnson captured his 20th US PGA Tour title on Sunday, firing a five-under-par 66 to beat Rory McIlroy by five strokes in the final round of the WGC-Mexico Championship. Steve Stricker will captain the US 2020 Ryder Cup team, vowing Wednesday to do everything he can to help the Americans regain the coveted trophy from Europe. Ji Eun-hee topped a tight leader board after a near-flawless performance on day one of the LPGA Thailand Thursday, as top-ranked home favorite Ariya Jutanugarn was forced to play catch-up. Tiger Woods is a seven-time winner of the tournament now known as the WGC-Mexico Championship, but it's a whole new challenge as he faces his first edition of the event at Club de Golf Chapultepec.